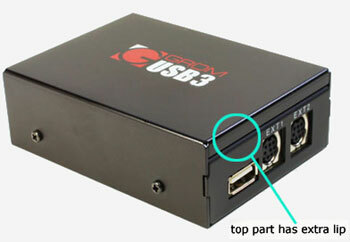 GROM Firmware Here you can download the latest version of firmware for your GROM-USB3 interface. Here you can download the latest version of firmware for your GROM-USB3 and GROM-USB2P interface with the serial number starting at 844 and up to 8462C. Please note that if you have the GROM-AND2 or GROM-USB2P(USB2) with the serial batch numbers that start with or in between of 831-843, please go to the GROM-USB2 and GROM-AND2 firmware update page for the applicable firmware. Check out the picture on the left for the visual reference. If your GROM kit metal casing has extra lip, please proceed with this page to download the latest firmware. Make sure you remove gromusb2.hex from the stick to avoid unwanted firmware change later ! Make sure you are renaming file correctly to gromusb2.hex and not gromusb2.hex.hex Check this out as this is mistakenly done all the time.